Powerstar Pawan Kalyan’s upcoming movie Katamarayudu songs released and received superb response from fans. Recently the movie completed censor formalities and received clean U certificate and the movie will release on 24th of this month. Today Katamarayudu movie pre release event successfully completed in Shilpakala Vedika. 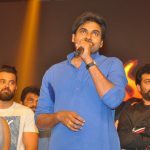 Check out the Pawan Kalyan Katamarayudu Movie Pre Release Event Photo Gallery.